Erik Varszegi grew up loving comic books. Now, he builds super heroes full time. Varszegi has a job that most kids -- and plenty of adults -- would dream about. He's a Lego Master Builder, one of only 7 people in the United States who are paid to build with the iconic little bricks all day. His specialty is building faces and the human form -- a talent that comes in handy when the company is tasked with building its famous life-size models for events like San Diego Comic Con. The newest of those figures is a 6 foot tall, 153 pound model of Captain America. 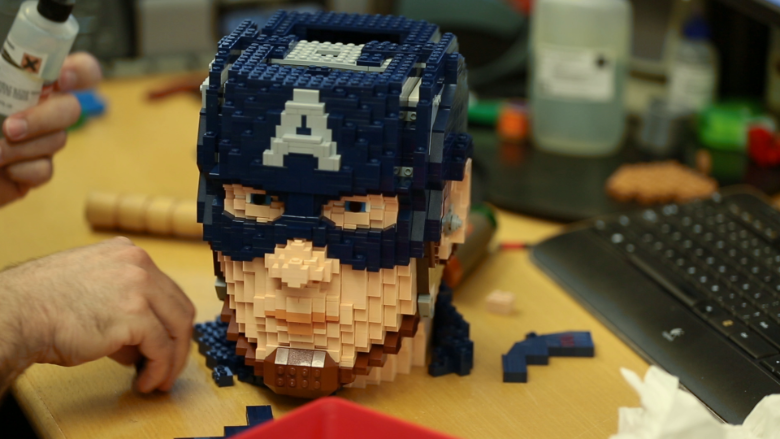 Varszegi's team spent 277 hours painstakingly shaping 25,984 Lego bricks into the spitting image of Chris Evans, who plays the Marvel hero on the big screen. But unlike most Lego projects, this figure didn't start with an instructions manual. "This actually is the 9th pose that I did for the model," says Varszegi. "There were a few that were radically different, but for the most part I started to refine the process around pose 4 or so." Before he lays a single brick, Varszegi spends hours at a workspace littered with Lego constructions past, designing a computer rendering of the figure in Lego's proprietary Brick Builder software -- a program that lets Master Builders plan their models block by block. And while almost everyone knows what Captain America looks like, Varszegi gets exclusive insights from Marvel, since Master Builders get to see movies ahead of their official premieres and have access to Marvel's library of superhero research. "They'll let us have access to a lot of their information," says Varszegi. "Sometimes, we have to keep quiet about that because of course, we're working on these things before the movies even premiere." After Varszegi lays his last digital brick, the design is sent off to Marvel for final approval. That's when the real building begins. Varszegi and his team have more than just bricks at their disposal. 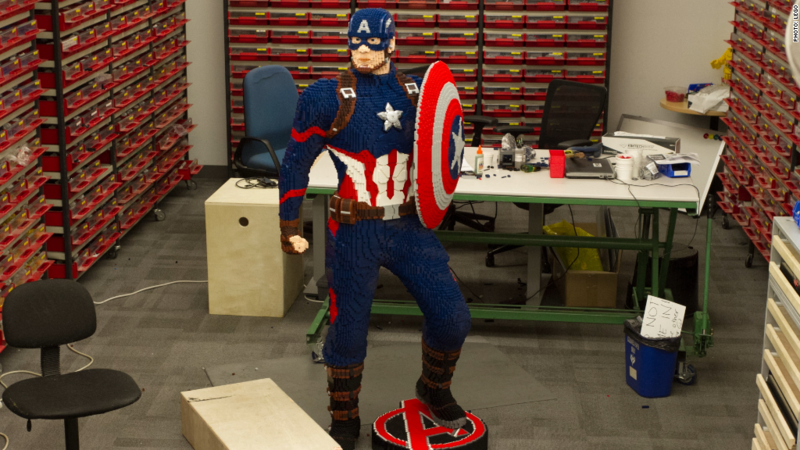 They use hammers and glue to build around a steel frame, ensuring that Captain America gets from the Model Shop in Enfield, Connecticut to San Diego safely. For Lego, showcasing a life-size superhero is an opportunity to highlight how much the bricks can do. "People a lot of times don't realize what you can really do with a Lego brick," says Amanda Santoro, brand manager for the company. "It really inspires kids, adults and fans to really think about things in a different way." And for Varszegi, the chance to partner with the biggest comic book companies in the world is a dream come true. "It's a great, proud feeling. I've grown up with a lot of these characters," he says. "My job was cool before, but then when we started to partner up with some of these comic book companies, that made my job even that much more fun."